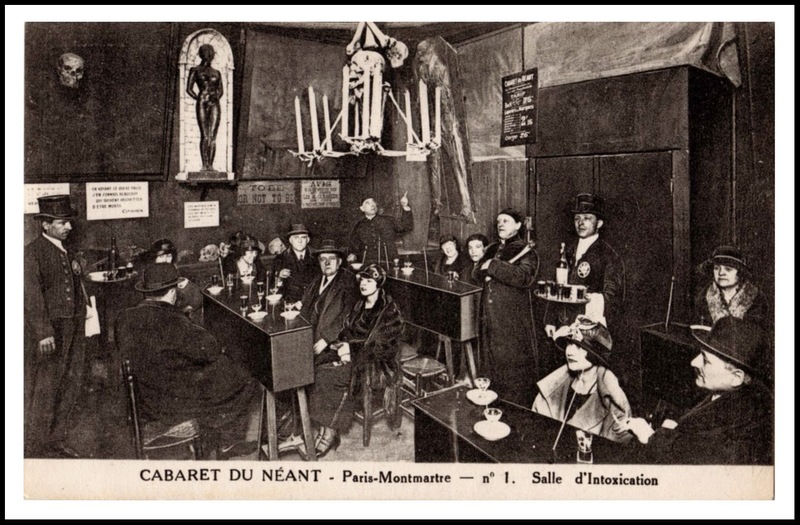 During La Belle Époque goth clubs weren't so many. But the ones that existed were very cool! In 1899 the book Bohemian Paris of To-Day came out. It was written by William Chambers Morrow and Édouard Cucuel and includes descriptions of several ghastly hangouts in Paris that the authors visited themselves. 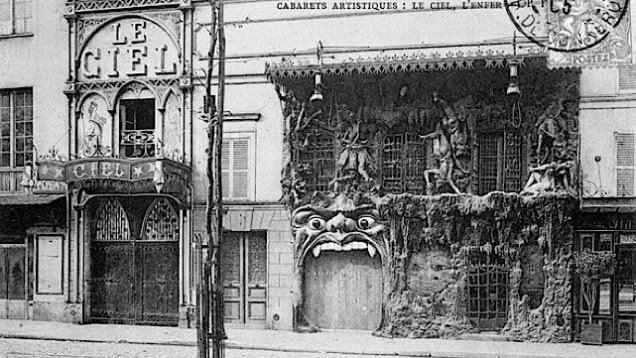 Above is a picture of two of these supernatural clubs, conveniently placed beside each other in Montmartre; Le Cabaret de l'Enfer (The Cabaret of Hell), and Le Cabaret du Ciel (The Cabaret of Heaven). 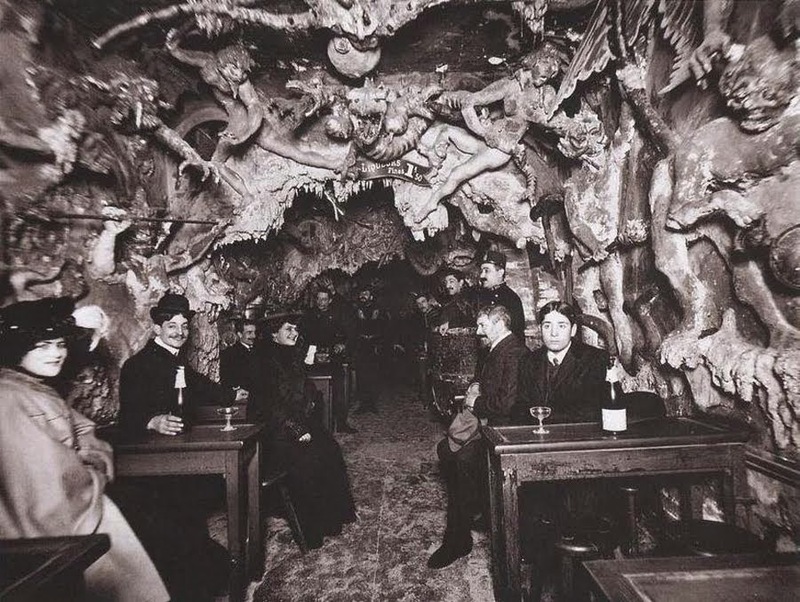 Going out for a drink at the Cabaret of Hell might actually have made your soul damned forever... Here is an account of the author's visit to this "cosy" nightclub: "Enter and be damned, the Evil One awaits you!" growled a chorus of rough voices as we hesitated before the scene confronting us. Near us was suspended a caldron over a fire, and hopping within it were half a dozen devil musicians, male and female, playing a selection from "Faust" on stringed instruments, while red imps stood by, prodding with red-hot irons those who lagged in their performance. Crevices in the walls of this room ran with streams of molten gold and silver, and here and there were caverns lit up by smouldering fires from which thick smoke issued, and vapors emitting the odors of a volcano. Flames would suddenly burst from clefts in the rocks, and thunder rolled through the caverns. Red imps were everywhere, darting about noiselessly, some carrying beverages for the thirsty lost souls, others stirring the fires or turning somersaults. Everything was in a high state of motion." If a visit to this haunted hangout made you feel a bit bad, you could always just go get your soul blessed at the Cabaret of Heaven next door! Here the guests were greeted by Dante and Father Time, and angels served the drinks. 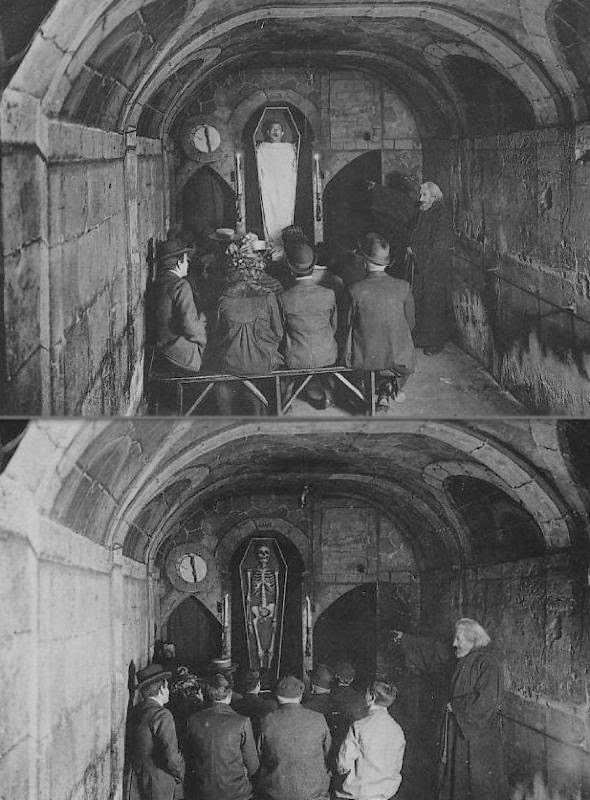 There was also a place called Le Cabaret du Néant (The Cabaret of Nothingness), where the tables had been replaces with coffins, and the drinks - named after diseases - were served by monks and funeral attendees. 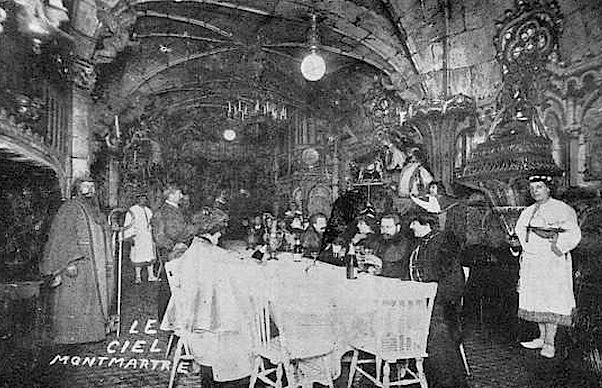 After a few drinks at Le Néant you could move on to other rooms, to witness how the hosts turned revelers into skeletons... Morrow's account from this place reads: "Large, heavy, wooden coffins, resting on biers, were ranged about the room in an order suggesting the recent happening of a frightful catastrophe. The walls were decorated with skulls and bones, skeletons in grotesque attitudes, battle-pictures, and guillotines in action. Death, carnage, assassination were the dominant note, set in black hangings and illuminated with mottoes on death [...] Bishop said that he would be pleased with a lowly bock. Mr. Thompkins chose cherries a l'eau-de-vie, and I, une menthe. "One microbe of Asiatic cholera from the last corpse, one leg of a lively cancer, and one sample of our consumption germ!" moaned the creature toward a black hole at the farther end of the room. Some women among the visitors tittered, others shuddered, and Mr. Thompkins broke out in a cold sweat on his brow, while a curious accompaniment of anger shone in his eyes. Our sleepy pallbearer soon loomed through the darkness with our deadly microbes, and waked the echoes in the hollow casket upon which he set the glasses with a thump. "Drink, Macchabees!" he wailed: "drink these noxious potions, which contain the vilest and deadliest poisons!" Sadly none of these places exist today. I would have made sure to visit them if they were still around though... 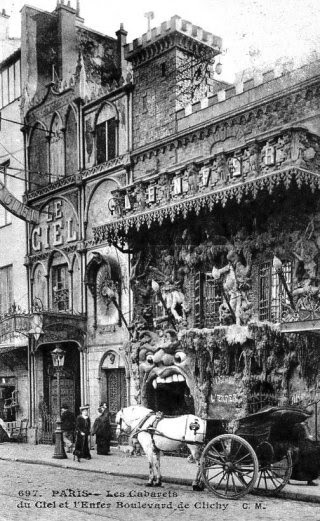 If you want to read the whole Bohemian Paris of To-Day you can find it uploaded online at Archive.org.